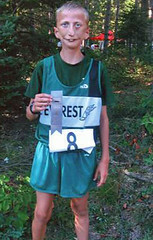 A Wausau-area school district is remembering a top cross-country athlete who died during practice this week. Fourteen year-old Forrest Goetsch of Ringle collapsed during the second lap of warm-up exercises Monday afternoon and later died at St. Clare’s Hospital in Weston. D. C. Everest Superintendent Kristine Gilmore offered condolences to the Goetsch family as well as the teen’s teachers and friends Gilmore said counselors are helping students and staff grieve the death. “This is an issue though, that takes a long time to heal, especially for students and staff who know Forrest,” Gilmore said. “It will be an ongoing process.” Gilmore said Goetsch was one of the top cross-country athletes at the junior high and was well-liked. An autopsy determined that Goetsch died from a cardiac-related natural death. “We were not aware of any medical issues,” said Gilmore. The medical examiner’s office is waiting for final autopsy results before they can say exactly what happened.